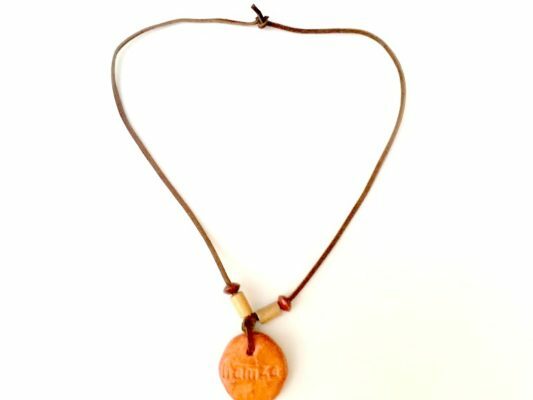 These essential oil clay diffuser necklaces are a great way to bring the aromatherapeutic experience, where ever you go. It’s so easy and fun to make with the kids, and can come in handy on days where the children are bouncing off the walls! I like to put lavender essential drops on it, as it provides a calming effect, and my children know to take a sniff whenever they need a little extra help calming down 😉 . 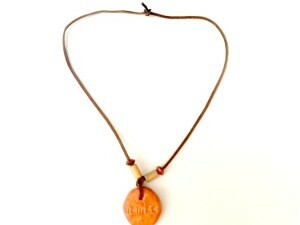 The advantage to making your own necklaces is that you can personalize it, and design it anyway you want. We chose to put names on ours, but you can get creative and write a message or just create designs. You can also inscribe on it in Arabic using a bamboo stick, or pencil. Working with clay has alot of benefits for children. 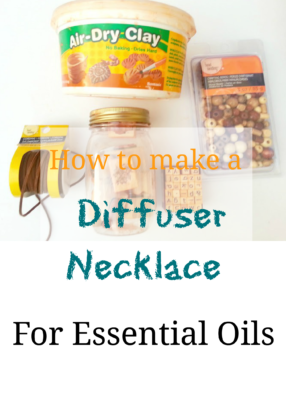 Not only does it help with sensory development, it also provides a very calming experience. If you don’t believe me, visit a ceramic studio for kids, and you will inshaAllah be amazed how quiet it is. Rarely will you find a child who has had a meltdown, or is hyperactive. As children work with clay, they are engaging many of their senses, and working with your hands in general, in any type of craft helps your brain in so many different levels. Make a round shape by rolling a sphere, and then flattening it with a flat surface. Alternatively, you can use something like a bottle cap to cut the shape out. 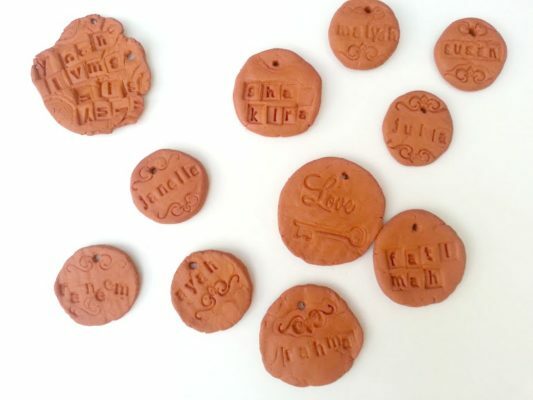 Use alphabet/design stamps, or anything which can create an imprint to add designs, or words. Poke a hole on top (but not to close to the edge) with a bamboo stick to make a hole large enough to fit the cord. 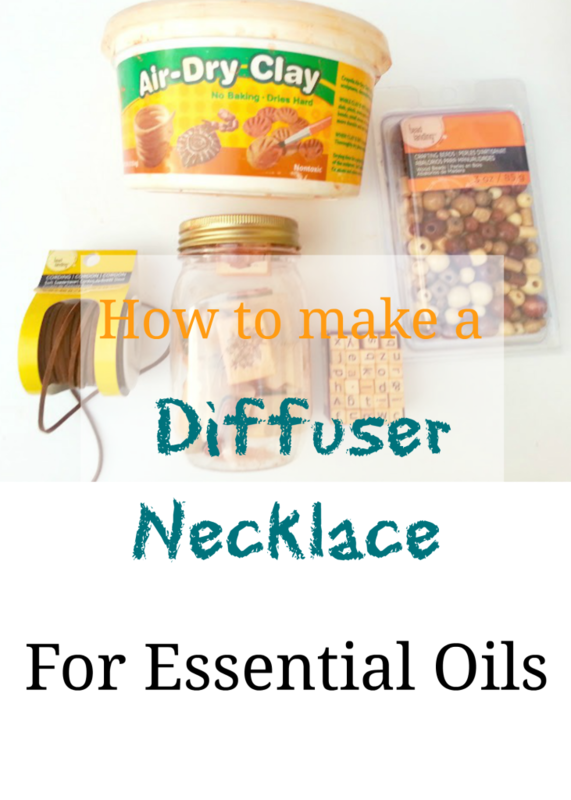 After 2-3 days, your clay diffuser should be dry enough to tread the cord through it. String in a few beads, if desired, for added touch. Put a few drops of your favorite essential oil (like lavender, lemon, peppermint, etc.) on it.